Rated 4.8 out of 5 based on 56 reviews. 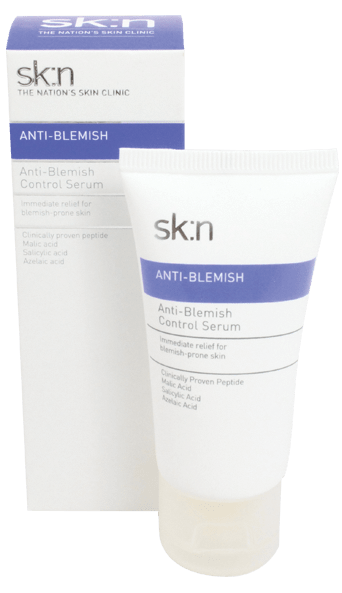 The sk:n Hydrator for Oily/Blemish-Prone Skin provides 24-hour hydration as part of the anti-blemish skincare routine. Suffering from spots, outbreaks and oily blemish-prone skin is common. Acne is a disease of the skin and can cause the sufferer great distress, trauma and anxiety. Under the effects of hormones called androgens, the sebaceous glands increase in volume and secrete more sebum (oil). In addition, cell turnover increases resulting in thicker skin and blocked pores. The oil that normally lubricates the skin gets trapped in blocked oil ducts. This results in pimples, blackheads, whiteheads, papules and pustules on the surface of the skin and deeper skin lesions called cysts. 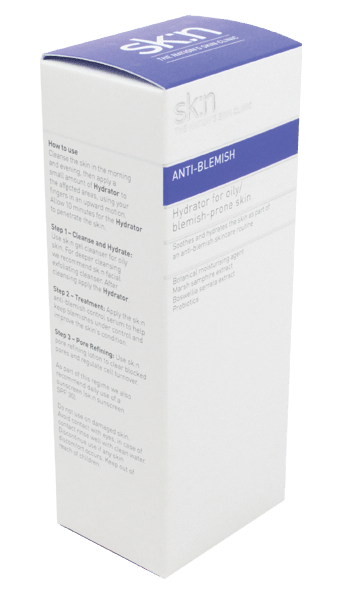 Botanical Moisturising Agent – creates water supplies and moisturises the upper layer of the skin for 24 hours thereby improving the barrier of the skin. This is highly important for dehydrated, acne-prone skin. Marsh Samphire Extract – provides anti-inflammatory effects which help reduce redness and tightness of the skin. Boswellia Serrata – obtained from Indian frankincense for its calming, soothing and anti-irritant properties. 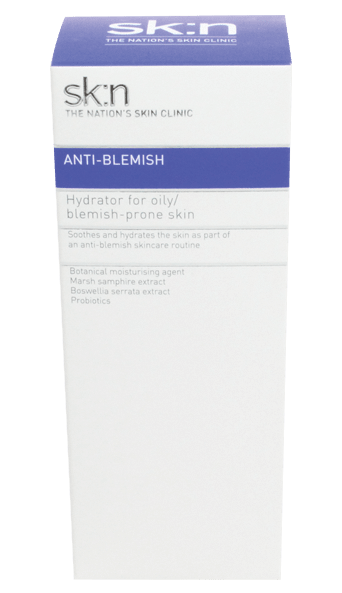 Pro Biotics – works to repair and protect the skin from external aggressions that preserve skin balance and luminosity for a healthy, balanced skin. It has a calming effect on the skin, therefore ideal for acne-prone skin. Cleanse: with sk:n Vitamin Rich Gel Cleanser for Oily Skin or with sk:n Facial Exfoliating Cleanser for deeper cleansing. Both can be used am and pm. 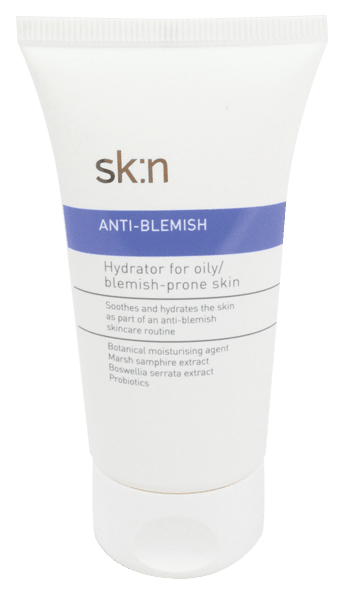 Hydrate: with sk:n Hydrator for oily/acne-prone skin after cleansing. A quality product which is worth the £30 price tag. I only need to use a little bit and it lasts for months and months. This product is non-pore-clogging and provides plenty of hydration. 5/5 stars!